Gino has always been obsessed with the arts. Even before going to school, he had a talent for the Visual Arts, and spent much time in his youth drawing. As a Teenager, he began to move away from using mainly the pencils and fountain pens he had used earlier, and now began painting with Oils. He tried Acrylics, but found them to be limiting. With Oils he felt he had more control over the flow and ebb of the colors, and the length of time to dry was longer, allowing for more thought into each Work. Gino also realized at this time that he liked to work on large scale, so many of the canvases he used were hand made or custom-ordered. Sizes up to 20 feet long and 8 feet tall were not unheard of. At this time in his life, most of the Works were made for friends or family members. When Gino was a young adult, he enrolled in the Ft. Lauderdale Art Institute in Ft. Lauderdale, Florida. While there he began working with the Airbrush and has since created some astonishing Works with this Medium. He has always loved surrealism as well as more traditional art, and has studied the Works of Salvador Dali, Michangleo, Da'Vinci, and Escher intensely. 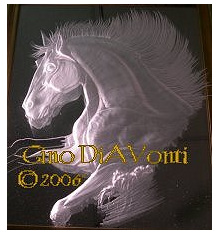 Gino loves creating Fine Arts, but also started taking Commissions at this time. Gino then began sculpting and found this to be his first love. He has carved many utilitarian items for use such as Desktops in the bas-relief format, and also has made many large Masterpieces that are strictly Works of Art. Today however, most of his sculpts are alto rilevo. (deeply carved, not slightly like bas-relief) Gino has done scads of live Carving Exhibitions in the Miami area. Currently the Artist is living in the Naples/Ft Myers Florida area. In 1983, Gino was given a slab of Corian, a then only white counter top material made by DuPont. He began carving it, and discovered that it lights from behind, putting a soft glow upon the face. There was an International Meeting for DuPont within a month of the completion of this carving; being held in the Orlando area. Gino attended, and to DuPont's surprize, they found their material carved was fascinating. Gino became quite popular with them, and free advertising was offered. Gino felt he could not keep up with the demands that DuPont made, and turned it down. But Ginos' introducing the carving of the Corian to DuPont became world-known at this time. Gino was the first to carve corian. He has since taught a couple of other people, but please be sure he was the first to do this. Gino has since carved Avonite, another material similar to Corian but at that time came in a much larger color variety, including a jade color, which he loved. Many alto-rilevo carvings came from this material within the next few years. While carving at a Show in Miami, he was approached by a Company that asked him if he could "carve carpet". He was at the time, carving a huge mahogany root into the shape of a pod of Dolphins. Ginos' reply was simply that if he could carve marble and wood, carpet could not be that hard. So within a few weeks, he began carving carpet and perfected it within a few months. For 15 years Gino made custom Sculpted Rugs from the start to finish, designing each group for the Individual tastes of the Client or Designer that he was working with. His beautiful rugs have been sold worldwide. He has even made rugs for the President of Columbia in 1998. Earlier in the same year, Gino gained access to a much larger Studio that totaled 1788 square feet. He has since spent the last year building it to suit his taste. After spending the summer putting up insulated walls, glass doors, a/c and a drop-ceiling, he has finally reached the point of truly customizing...i.e. 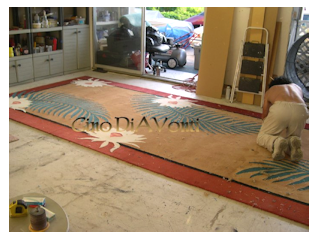 : those finishing touches that make the Atelier look like only Gino could have envisioned it. It now contains a 24 x 24 Sculpting Room, a 12 x 24 storage area and a 12 x 24 Gallery area. He also does his oil paintings in the Gallery. He has built a large Office, and an insulated room for his Kiln. Putting the building of the Studio behind him, Gino can now continue to work in the many mediums he has mastered, and has several projects going at one time. As the GRANDEUR magazine article mentions, between commissions he is concentrating on the sculpture of Wall alto rilevos, then the molding of such for reproduction. He also loves making the custom sculpted area rugs, and designing a set intrigues him to create something new and unique for that person.